Four Lok Sabha MPs are selected for the Sansad Ratna 2015 Awards for outstanding performance in the 16th Lok Sabha till the end of the budget session. “The MPs were selected through a rigorous process by a high powered Committee of Judges. Prime Point Foundation, a Chennai based NGO, has been honouring top performing Lok Sabha Members every year since 2009” said the Foundation’s Chairman K Srinivasan. 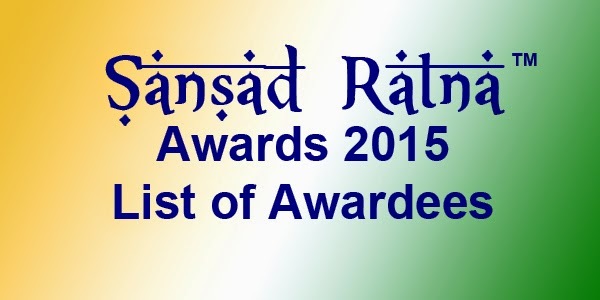 The Awards will be presented on 11th July 2015 at Chennai. They were toppers each under the category of Questions, Private Members Bills and Debates. They will also be inducted into ‘Sansad Ratna – Hall of Fame’ during the Award ceremony on 11th July 2015..
Shri Shrirang Appa Barne (Shiv Sena MP from Maharashtra) bags an Award by topping under ‘Questions Category’ with 314 Questions to his credit with a total tally of 355 points. He secured the No 2 position among all MPs in the overall tally. There should be more publicity to this selection in all print and electronic media. Those MPs who burn their midnight oil and study the cases and contribute should be known to the public as against those who make a mockery of our DEMOCRACY. Not only the top and bottom seats all should be evaluated and the scores published to keep up our hard-earned freedom and democracy.